Acoustic Guitar Pickups offer a way for you to convert the soundwaves coming from your acoustic guitar into an electrical signal. All 3 pickup types can be used either alone or in conjunction with you acoustic guitar. They are Microphones, Magnetic Pickups, and Piezoelectric Pickups. Below you will find a brief overview of how each one works as well as a description of each types strengths and weaknesses. Remember that even though the are described independently, you are free to use one, two, or even all three together to produce the type of sound you are looking for. Also I focus only on the acoustic application here. For more info on their hard-rockin neighbors check this out instead. Microphones provide a very accurate conversion of your sound into an electrical signal. This is because they "hear" sounds the same way our own ears do. Though they are different than the mics used for vocal recording in both style and scale, they are exactly the same in terms of how they work. This type of acoustic guitar pickup is slightly different from the others. For a more in-depth description check out the Microphone page. Since setting up a microphone can be a bit tricky in our home based studio, another option is to have a mic internally mounted to the sound hole of the guitar. This eliminates the problem of keeping the instrument in the mic's sweet spot for the entirety of the recording take. Due to the smaller size of these mics it's likely that a condenser will be best option. + very accurate sound reproduction especially at high frequencies. 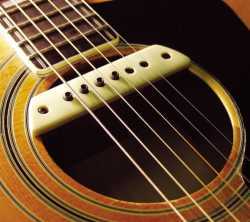 Magnetic Pickups (also called sound hole pickups) are the standard for electric guitar pickups, but they can also be used effectively as acoustic guitar pickups. These pickups are simply magnets that can detect a change in their magnetic fields when a steel string is put into motion. They do not "listen" to the sound of the guitar but rather "sense" the motion of the strings themselves. As a result they are very resistant to feedback issues. The drawback with detecting sound in this way is that it is very unlike how our ears work, so the resulting signal tends to be altered from how the guitar truly sounds unplugged. Due to the similarities in technology, these tend to produce a more "electricky" kind of sound... which I know isn't a word but it's the best way to describe it. + easy to install / remove. - tend to have a harsher more electric tone. These are probably my favorite simply because I am amazed at how the technology works at all. Piezoelectric pickups (also referred to as contact pickups) use a stripe of material that generates a very small voltage when a force is applied. This material is a crystal that lays underneath your saddle as shown in the picture. So basically if the mics "hear" the sound, and the magnetic pickups "sense" it... we can say that these "feel" the sound. More accurately, they feel the vibrations of the strings through saddle of the guitar and transform it into an electrical signal that can go to be amplified. + recreates sound from entire guitar body rather than just the strings. + more resistant to feedback than microphone. 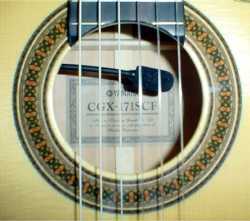 + can be used with nylon strings (classical guitar). - could require permanent alterations to guitar (under-saddle). So now that you have the facts let's get down to what's really important. As I said earlier, you can use all of these stand-alone or in conjunction to produce just the right sound for you. 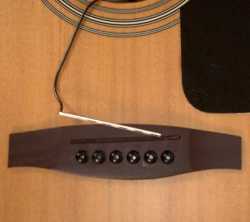 Take the strengths and weaknesses into consideration as no type of acoustic guitar pickups are right for everybody. That being said it's hard to argue with the simplest solution, and in this case it's the magnetic pickup option. It gives you the freedom to move around while you record, immunity to feedback issues, and the convenience of being able to install and remove it easily as required. If you're concerned about not having a true-acoustic tone then you can always double book your vocal mic (for which I recommend a Condenser anyway) to provide that capability. It's not the gospel of truth, but if you're looking for a suggestion to get started that would be it.